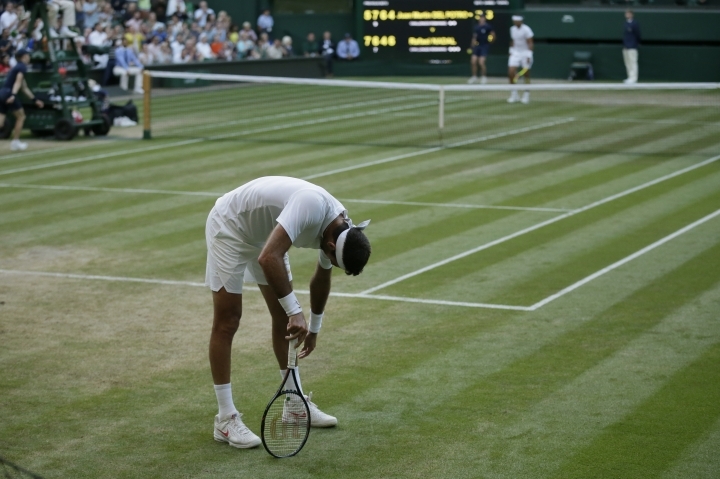 LONDON — When the 4 hours, 48 minutes of diving across the grass and leaping into the stands, of slipping and sliding, of so many moments of great tension — and, above all, great tennis — were done, when Rafael Nadal had sealed his Wimbledon quarterfinal victory, the man he edged, Juan Martin del Potro, was face-down at a Centre Court baseline. "I wanted to stay there," del Potro said afterward, "all night long." He did hold that pose, a mixture of full-on despair and utter exhaustion, for a bit, which felt appropriate. 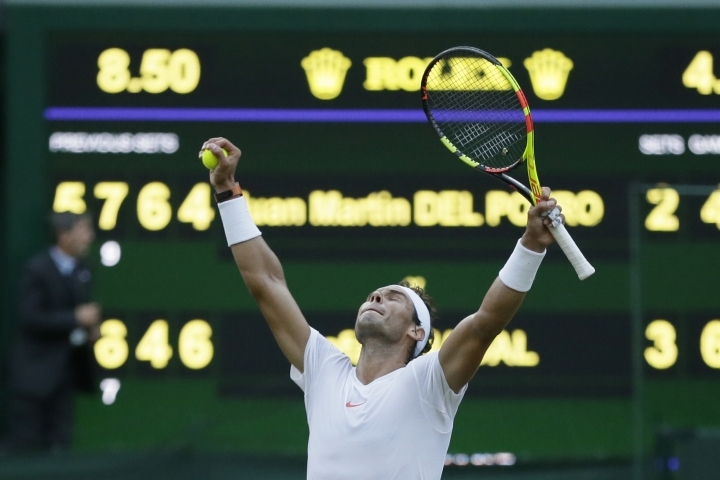 So, too, did what happened next after Nadal won 7-5, 6-7 (7), 4-6, 6-4, 6-4 Wednesday and earned a trip to the semifinals at the All England Club for the first time since 2011: He went over to give del Potro a lengthy hug. Then they walked to the sideline together, arms draped across each other's shoulders. "Emotional match for both of us," said Nadal, who is ranked No. 1 and seeded No. 2 and won two of his 17 major championships at Wimbledon. "And for the fans, too." Now Nadal will face longtime rival Novak Djokovic in the semifinals Friday. It will be their 52nd career meeting; Djokovic leads 26-25. Djokovic, a 12-time major champ whose resume includes three trophies at the All England Club, advanced earlier Wednesday with a four-set victory over Kei Nishikori that didn't require nearly as much energy or effort as what followed on Centre Court. And Nadal rued failing to take control against del Potro much earlier. Nadal could have gone up two sets to none after leading 6-3 in the tiebreaker. But he blew those three set points, the last with a double-fault he later called "a big mistake." Nadal wasted a fourth chance at 7-6, before letting 2009 U.S. Open champion del Potro grab three points in a row for that set. After del Potro also took the third, repeatedly taking points with his thunderclap of a forehand, Nadal knew he needed to make some adjustments. The most important was pushing forward: The Spaniard went to the net a total of 23 times over the first three sets, and upped that to 24 over the last two, winning the point on 19 of those. 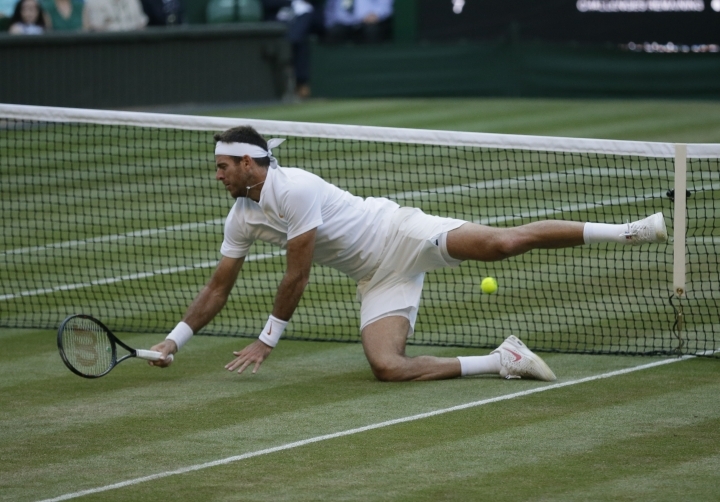 At 1-all in the fifth, del Potro jumped to his right, rolling along the turf and losing his racket, for a volley winner, and then celebrated by raising both arms. Later in that 14-point, four-deuce game, Nadal chased a ball to no avail, sprinting so hard he was carried all the way over to the seats. He stepped on the short wall and landed in the lap of a female spectator. Soon, Nadal gained the upper hand, shaking off a hard fall onto his back on one point by whipping a cross-court backhand winner on the next to break for a 3-2 lead. That never really felt like much of a cushion, though. In the next game, Nadal staved off two break points, the first when he used his never-give-up-on-a-ball defense to stretch a point and del Potro pushed a forehand way long. Del Potro put both hands on his head. "Against Rafa," del Potro said, "you must go for winners all the time." Then, at 4-3, they played an epic 18-point game that featured six deuces and another trio of break points for del Potro, none of which he managed to convert. Soon enough, del Potro was down on his belly after one last slip, as Nadal finished off the victory with a volley. "Rafa is a fighter," del Potro said. "Also, he has a fantastic game."